What is the first thing, from which we recognize a person is a doctor or a lawyer, is his/her dress. What completes a doctor is not his/her white coat but his/her “Stethoscope”. Whether you are a nurse or a medical student or a physician, “Stethoscope” becomes an important surgical tool. The stethoscope is an acoustic medical device for auscultation, or listening to the internal sounds of an animal or human body. It typically has a small disc-shaped resonator that is placed against the chest, and two tubes connected to earpieces. It is usually used as a medium to listen to lung and heart sounds. It is also used to listen to intestines and blood flow in arteries and veins. Thus came the discovery of the most famous and most reliable, doctor’s friend Littmann Stethoscope, invented by David Littmann. Stethoscope became the symbol of healthcare professionals. Our kids are our biggest assets. In their infancy, a child faces some circulatory and respiratory problems. So it becomes important to understand your kid’s health as they can hardly express. The biggest myth is that stethoscope is only used by medical practitioners or physicians. Rather it can be used by any family to ensure their family’s health. Littmann Stethoscopes are not used to listen to the heart beats but it can be used to ensure your lungs frequencies, digestive system. It can also be used during pregnancy. Women now listen to your baby heartbeats with highly versatile Littmann Stethoscopes. How to choose the right Littmann Stethoscope classic II? How to Use Stethoscopes in a right manner? The patient should be disrobed properly so that the stethoscope should be placed properly on the chest. The biggest myth is finally out that stethoscopes can also used by various families to ensure the health of their respective families. It’s a must part for not doctors, nurses or physicians but also for families. We at surgicalshoppe.co.in is always there to share knowledge with our customers. 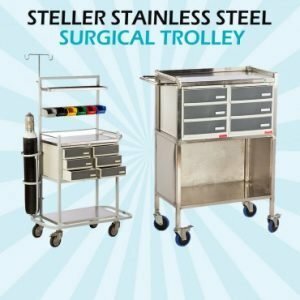 Please do explore our website www.surgicalshoppe.co.in for unique and quality medical products.